Blk 1002, Toa Payoh Lor 8, #01-1477, Singapore 319074. Inside the industrial park, near the golf driving range, polyclinic and Indian temple. 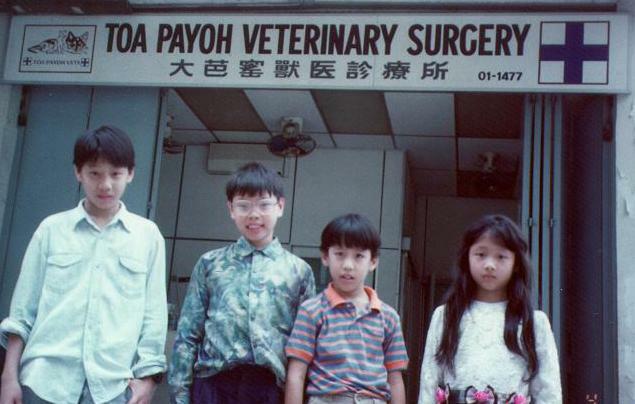 9668-6468 (Dr Sing), 9668-6469 (James for appointment). A private small animal practice. Mainly dogs, cats, hamsters and rabbits. 10am - 5pm daily including public holidays and weekends. BY APPOINTMENT ONLY to save time. Pet owners are welcome to drop in without appointments but sometimes we are in the middle of surgery and Caesarean deliveries. We will not be able to attend to you promptly. Please call us if you can't turn up after making an appointment. 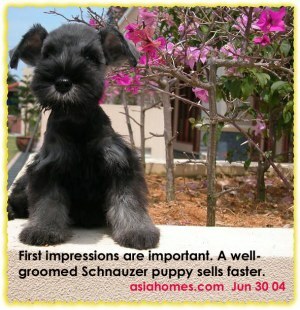 BE KIND TO PETS - A COMMUNITY EDUCATION FOR PET LOVERS using narrative stories and pictures is sponsored by ASIAHOMES.COM, "affordable homes for expatriates". 8. EMERGENCY CAESAREAN DELIVERY. lst pup stuck. Dam bit when owner tried to pull out. 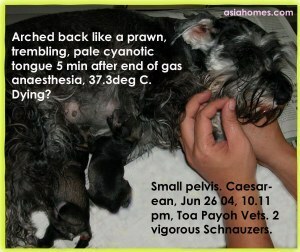 Could not locate new vet to perform after-hour Caesarean. lst pup dead sometime. 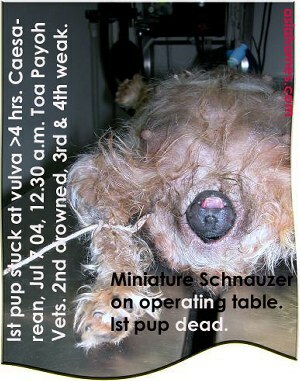 2nd pup drowned in amniotic fluid (nose full of white mucoid discharge). 3rd & 4th pup very weak but alive. Would they survive past next 14 days? 7. ELECTIVE CAESAREAN DELIVERY. A home breeder with first-time experience of canine birth. 64th day, water bag rupture but mother just sat down. Decided on elective Caesarean at 3 a.m after > 1 hour of waiting. 3 vigorous red-tongued big-sized puppies with full grown hair, suckling milk before sending home. 6. EMERGENCY CAESAREAN DELIVERY. This home breeder booked an elective Caesarean. The first puppy was born naturally. When the 2nd puppy had difficulty in being born. Over 2 hours passed. As he decided to go to the vet, the puppy was born, gasping and with a purplish nose and tongue (2nd from left). It died soon. 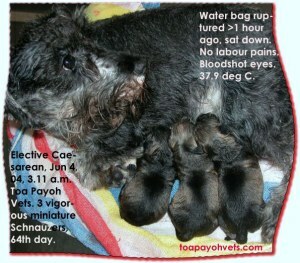 The 3rd puppy was delivered by Caesarean. It was enclosed in a large sac of bright yellow meconium (puppy stools), but it was vigorous. 5. ELECTIVE CAESAREAN DELIVERY. This experienced breeder knew one pup was large, from X-rays and decided to operate after the rectal temperature had dropped below 37 deg C. The miniature Schnauzer cramped up like a prawn 5 minutes after the end of surgery, had very pale purplish tongue. Emergency measures to revive her and a Calcium injection. She was an excellent mother to 5 pups (3 from another could-not-be-bothered miniature Schnauzer). 4. STRESSED OUT. Shopping for the puppy's accessories the whole afternoon and veterinary health examination. 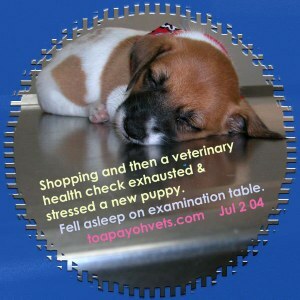 The Jack Russell puppy just could not keep awake during examination. Best to rest the puppy at home rather than taking it out on day 1 of purchase. Some puppies develop fever or diarrhoea owing to stress of moving to a new home and lack of rest from playing with the children. 3. ELECTIVE CAESAREAN DELIVERY. 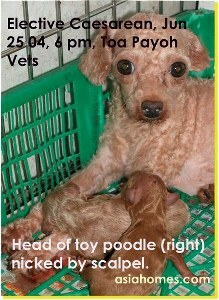 This top breeder knew that the pups would not be born naturally and got two vigorous toy poodles by Caesarean delivery. 2 pups jammed together in the small uterine body, making it hard to pull them out. The head of one pup (right) was just below the scalpel and was slightly cut during the incision of the sharp-pointed uterine body but it was normal and accepted by the nervous mother..
2. ELECTIVE CAESAREAN DELIVERY. 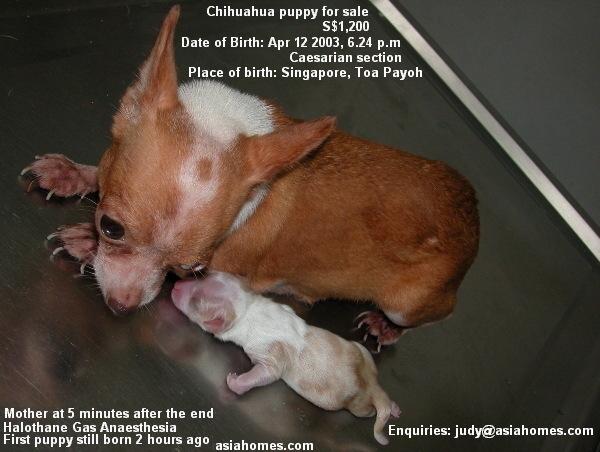 This experienced Chihuahua breeder knows that Chihuahua puppies are easily stressed and die if the mother can't give birth naturally and has prolonged labour. 2 extremely vigorous pups are delivered by a Caesarean section of the breeder's choice of timing. 1. TIPS FOR PET SHOP OPERATORS. Put a colour picture of the puppy for sale in your pet shop sales or vaccination card. This will make your customer remember you fondly as the puppy grows up over the years, when they see the card or go for annual vaccination. Tel 6254-3326 (Toa Payoh Vets), email judy@asiahomes.com to make arrangements. Tel Big Breed Transport Chye 9686 1794 for big dog transport to any vet. 3. Veterinary administrator (competent in Microsoft Excel, Pagemaker, Chinese word processing software, Access and Word). 6254-3326, 9668-6469, 9668-6468, 6256-0501 (fax).